After daffodils, stocks have got to be one of the cheapest flowers to buy. These were quite tall but I cut them really short and sat them in this favourite vase bought many years. I love the contrast of the rich pink against the inky blue. And their scent is making our bedroom heavenly sweet. I absolutely love stocks, they are beautiful. Great photos too. I shall look out for some next time I'm in town, you have reminded me how lovely they are. So pretty, bet they smelt great. These are gorgeous pics. I love stock although I sometimes think they don't love me and may trigger my hayfever. Still on cheap tulips here but planning on gathering lots of wildflowers this year. 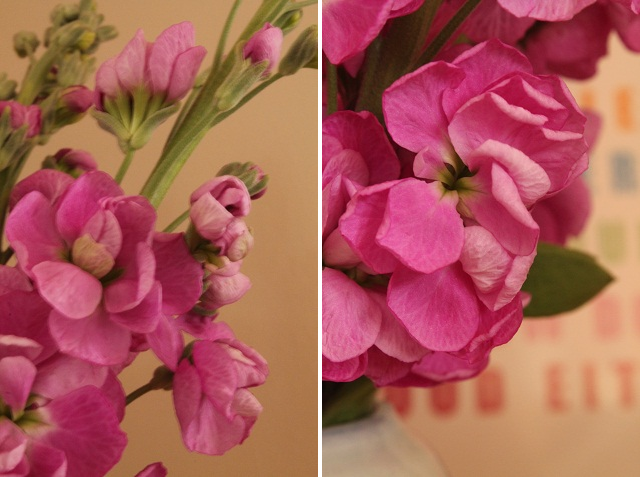 The pink looks great against your vase. Stock are lovely, but my favourtie flowers for fragrance (which I grow every year) have got to be hyacinths and sweetpeas, but OH doesnt like either inside so I have to enjoy them in the garden. Ooh, I do love a nice bunch of stocks :) But they make my husband sneeze so they're a rare treat here, and never in the bedroom.